to correct such mistakes. Voters finding such problems in their voter Ids can adopt the following simple methods. * From the new tab that opens, select “Form 8”. 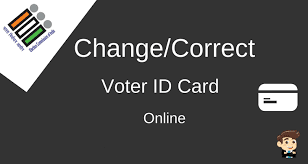 Voters will automatically be redirected to the page where request for the ‘voter card correction’ can be made. * Following details need to be entered – Name, serial number, age, gender, state, part number of electoral roll, Assembly/Parliamentary Constituency to which the voter belongs, family details (name of mother/father/husband), complete address. * If you already have a voter ID, submit details like issuing date, card number, state where it was issued. * Once the details are entered, upload the required documents supporting the information mentioned, including the latest photograph, valid ID and an address proof. The portal for Show piece. The related officer will not get anything hence he dont scratch his head. I have submitted the application but no action has been taken it is still shows as submitted. I submitted F8A Aplication Form Feb,2017 there is no response till date.